Baba Sitaramdas Omkarnathji was a well known saint of Bengal in the twentieth century. He had thousands of disciple and followers all over India. He had great reverence for Ma and would ask his disciples to go for Ma’s darshan whenever they have the chance to do so. Very often he used to come for Ma’s darshan.Ma also visited him whenever she had her kheyal. Baba had a great following with 61 ashrams all over India, but before Ma, he came with childlike innocence. As long as he could walk, he came and returned with face towards Ma, prayers flowing out from his mouth. Baba regarded Ma as Adyashakti (a form of Durga). Once he said in Satsang, "Durga appear on the horizon when the time comes". Then winking at Ma he further said, "No question of appearing, Durga has already appeared". Oh! Kind Mother, Beloved Mother, assuming all forms Thou art playing with Thyself. Before creation Thou alone existed. The desire arose in Thee. Let me be born, let me multiply. It is Thou who became Mahat, Ahamkara, Pancatanmatra and Pancabhuta. It is Thou who became the thousands of millions of Universes (Brahmanda). Hundreds of millions of Salutations to Thee and Thy Lila (divine play). I bow down today to Thy triumphant cosmic play. On the occasion of Bijoya Dashami in 1388 (1981 )this letter was written by Sri Sri Sitaramdas Omkarnath from his Rishikesh Ashram to Sri Sri Anandamayee Ma then staying at the Kankhal Ashram. This wonderful letter constitutes the beginning of the book (Anandamayee, the Universal Mother). It is almost like the birth-throes of the One becoming the Many, like a stupendous effort to spread oneself out in the Cosmos. Our mother as the sustainer of the cosmos (Jagaddhatri). He has prayed to her to manifest herself in her full divinity, breaking all barriers of ignorance. But even prakasa (Self-revelation) cannot manifest itself without the help of Vimarsa (Self-contemplation). That prayer has been fully embodied in the aforesaid letter. "This is Ma Bhabatatini, the Bhairabi of Dakshineswar whom Thakur (Sri Ramakrishna) used to worship". This, again, is from Thakur Sri Omkarnath. Now we come to that point. 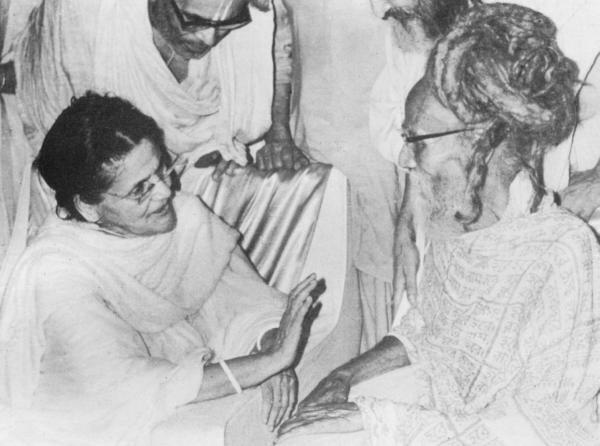 Sri Sri Ma was herself her own Guru. But the shastras and the teachings of great spiritual masters unanimously declare that for every Sadhaka (Spiritual aspirant) in quest of liberation (Mukti) must receive initiation from a Guru. In this context one gathers from the spiritual discourses of M. M. Gopinath Kaviraj that an external Guru becomes unnecessary for one in whose soul right spiritual intuition arises spontaneously. It is a rare exception. We witness this exception in the case of Sri Sri Ma. The question then will arise Can any exception which violates the natural causal relation (between Guru and Sisya) enjoined by the Shastras be admitted? How is one to reconcile this contradiction? ...It seems therefore, somewhere there lays a mystery, a profound spiritual mystery, which eludes our intellect. We are thus bewildered. It is the second quotation from Thakur Sri Sri Omkamath, which can rid us of this delusion. In the light of this observation, we find no difficulty in admitting that what appears to be an exception to or a transgression of the Shastric injunctions is in reality an unfathomable mystery. So far from being an exception or violation, it is not even a transgression of the principle of causality; rather, it is a terminal point of a long-connected causal sequence taking us back to the previous incarnation and culminating in the moment of birth of Sri Sri Ma. In 1982 Gurupurnima was celebrated in Ma’s divine presence at Mr. M.L. Khaitann’s bungalow on Rajpur Road, adjacent to our ashram at Kalyanvan, Dehradoon. Immediately after the celebration Ma was taken to Kishenpur ashram, Dehradoon. In our eyes Ma was critically ailing at that time. Her stomach could not retain anything; not even water. She used to vomit everything. Because of her physical indisposition darshan was almost stopped for the visitors. Even ashram inmates' visit to Ma was restricted. People from various places flocked to Dehradoon to have a glimpse of her and know about her physical condition. Devotees and ashramites were doing their best, engaging themselves in Puja, Japa and scriptural recitation with the resolve for her early recovery. During that time the Shankaracharya of Shringeri Math with his entourage came to visit Ma. He also requested Ma to have her Kheyal to recover. Ma told him, “Father this body is not ill at all. It is the pull of the unmanifest.” This utterance of Ma made everyone very concerned that she would leave her mortal frame. The news of her physical condition reached Baba Sitaramdas Omkarnathji also. He was observing Gurupurnima with his disciples at Kanyakumari in the south of India. This caused him to become very intent on seeing Ma. Immediately after the celebration he came to Delhi, changing plane three times, and drove to Dehradoon. Because of his stiff knees and legs he was immobile and could not walk. His attendants had to carry him on their shoulders. It was almost midday when he reaches Kishenpur ashram with a group of disciples, bramhacharis and dandi swamis. They came straight to Ma’s room on the first floor. He asked Udasji and others, Ma’s female attendants to leave the room immediately and closed the doors and windows. Brahmachari Bhaskaranandaji (he was a naistic brahmachari in ochre robes at that time) had to leave the room to make arrangements for entertaining the group that was accompanying Baba. Only Brahmachari Shantibrata was attending Ma in her room. He was observing a vow of silence for the last three years through Ma’s kheyal. He was not allowed to talk to anybody except Ma. Baba was carrying all along a small earthen pot in his hand with water in which something had been soaked, right from when he started his journey from Kanyakumari. He was reluctant to hand it over even to his attendants. He was insisting on Ma drinking the water from the earthen pot. He said, “ Ma this is water with fennel seed soaked in. I have prepared it with my own hands and was carrying it right from Kanyakumari. You have to drink it and all your ailments will be gone.” Ma did not have the kheyal to take it. With feeble voice she was expressing her unwillingness. But Baba was very assertive. Then you can stay in the room.” Baba said. Baba asked the person who was carrying him on his shoulders to bring him near Ma’s cot. He asked the dandi swamis to join him and started chanting Omkar with a protracted sound. Along with this he was caressing Ma from her feet to her head. The room became charged and vibrant with the holy sound. The process continued for no less than fifteen minutes. Baba left for his ashram at Rishikesh.